San Francisco is set to be the first city in the US to require mobile phone retailers to post radiation levels next to handsets they sell. The board of supervisors, or council, voted 10-1 to approve the measure, with final approval expected next week. "This is about helping people make informed choices," said the law's chief sponsor, Supervisor Sophie Maxwell. The mobile phone industry said studies showed cell phone radiation was not harmful to people. The Federal Communications Commission has adopted limits that set out safe exposure to these kinds of emissions. 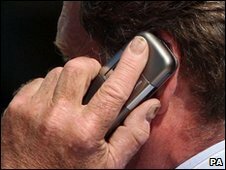 The measurement defines the amount of radio waves that people can safely absorb into their bodies when talking on a mobile phone. Some researchers have claimed such emissions can be linked to cancer and brain tumours but there remains little scientific consensus on the matter. "This is not about discouraging people from using their cell phones," said Tony Winnicker, spokesman for San Francisco Mayor Gavin Newsom, who has said he will sign the legislation into law. "This is a modest commonsense measure to provide greater transparency and information to consumers." The mobile phone industry's body, the Cellular Telecommunications and Internet Association (CTIA), disagrees and has warned that posting radiation levels next to handsets could in fact cause more confusion. "Rather than inform, the ordinance will potentially mislead consumers with point-of-sale requirements suggesting that some phones are 'safer' than others, based on radio frequency emissions," said John Walls, vice-president of public affairs for the CTIA. The legislation would require all retailers to display details of the emissions alongside the phones and point consumers to where they can find out more information about the issue. Violators would face fines of up to $300 (£200). The San Francisco Chronicle reported that a similar right-to-know measure, proposed by state Senator Mark Leno, failed in the California senate earlier this month following heavy lobbying by the mobile phone industry.